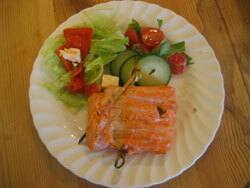 Barbecue trout recipes are easy provided you have one essential ingredient – freshness. Fresh trout and fresh accompaniments make all the difference and here’s a couple of great examples, a novel cooking technique and to finish a recipe for salmon trout. 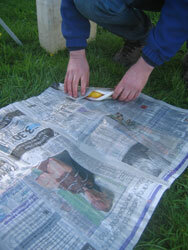 Trout In Newspaper - Read all about it! As you can see in this picture, you don't need to have state of the art equipment to grill fish. The cooking time is so short that fish is ideal for cooking in this way. I took this photo whilst on holiday in France. The group of people that were next to us on the camp ground were leaving the next day and didn't want to buy a large bag of charcoal so they just bought one of those small disposable charcoal barbecue grill trays for their final cook out. 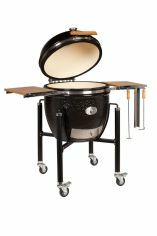 (It just goes to show that still many think of BBQ grilling as cooking only for vacations whereas us seasoned all year round grillers take charcoal with us wherever we go!). Best known of the trout family is the rainbow trout which is farm reared extensively. The river trout or brown trout is a game fish and available only when in season. Generally speaking you can buy it locally rather than through the supermarkets so it is not that common but it is well worth searching out. Cooking any of these barbecue trout recipes takes about 15 – 30 minutes depending on the size of the fish and the only thing you really have to worry about is ensuring that the fish doesn't break up. Your best bet is to use a fish basket or teflon mat that has been brushed with cooking oil as this makes flipping easy. TIP - oil the grill plate and the fish basket and this will stop the fish from sticking and breaking up. 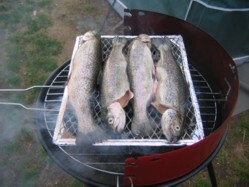 Grill the trout on medium coals for about five to ten minutes on each side depending on the size of the fish. TIP - You can tell when trout is cooked because the eyes turn a milky white color. BBQ trout is so easy and so tasty, all you need is a good fresh flavored rub / stuffing or a light sauce to drizzle over. I love a little spice in my barbecues and so I’m going to start with one of my favorite barbecue trout recipes. There's nothing in the spices so just look out for the fish! Mix up all the ingredients to make your rub. Take your trout (washed and gutted) and make some some oblique slashes down each side of the trout, this helps the spice mix penetrate deep down into the flesh of the fish. Now simply rub the spice mix all over, in the cavity and into the slashes. Refrigerate for an hour while the spices do their work and it’s time to light the barbecue. Fennel goes very well with trout so for this grilled trout recipe we're going to do a simple grilled trout and drizzle over some homemade fennel oil. I also wanted to add some heat to this one so there's birds eye chillis in there too. The chillis are small but that doesn't mean that they are mild (far from it) so feel free to reduce the number of chillis if it's not your thing. Nothing to report except for fish. Crush the fennel seeds in a pestle and mortar just enough to release the aroma and add to the olive oil. Remove the seeds from the chillis, chop them and add to the oil (remember to wash your hands afterwards!). The longer the oil stands, the more the flavors take hold so don’t use it straight away, leave it 30 minutes. 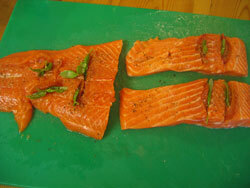 Make a couple of incisions with a knife diagonally down each side of the trout to help it cook more evenly. Rub in a little of the fennel oil (not too much otherwise it will cause a flare up) and season with salt and pepper. Grill for the requisite 10 - 15 minutes over medium heat flipping once and when your trout is cooked serve with a simple red tomato salad and drizzle over some more fennel oil. Substitute the fennel with two cloves of garlic and the zest of one lemon. This is one of the easiest steamed barbecue trout recipes ever conceived. It's such a simple recipe that keeps all the flavor in the fish. If you're going on a camping trip or doing a spot of fishing then this is the recipe for you because it's equally as good on a camp fire as it is on the grill. There's a saying in England that today's news is tomorrow's fish and chip paper and this is so apt considering the quality of journalism today. Wrapping fish and chips in newspaper was one of the great paper re-cycling stories before the environment was on the political agenda but sadly our chip shops now have to use clean paper with no ink. Gut your trout (your fishmonger will do this – unless you're in the woods), season with salt and pepper and stuff a slice or two of lemon in the cavity. 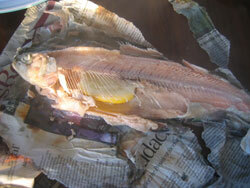 Take 3 or 4 sheets of newspaper (you may need the Wall Street Journal if it's a large fish!) 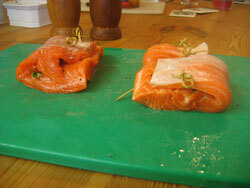 and wrap up the fish, dunk the parcel in water so that it's completely soaked and place it on the grill. Give it 25 – 30 minutes and peel back the paper. If it's done, the newspaper will be dry, the eyes will be milky white and the skin of the fish will come away with the paper. As opposed to rainbow or brown trout, this is salmon trout. No relation to salmon, but this fish has a similar colored pink flesh and great flavor. I first cut it into steaks so don't worry if you haven't got a full side, trout steaks (or salmon steaks) are great for this recipe. You'll also need to soak some cocktail sticks for trussing the fish. Take your sun dried tomatoes and slice them as best you can into thin slices (it doesn't have to look pretty) and pick your basil leaves. Take a sharp knife and make a couple of incisions in the thickest part of the fish steak but not the whole way through. Into each incision stuff a piece of sun dried tomato and a basil leaf then fold the steak over and use the cocktail sticks to truss it into position. Baste the fish generously with olive oil to stop it sticking to the grill (and / or use a Teflon mat) and carefully place the it on the grill. Cook on the “thin” side for about 5 minutes and the baste again with olive oil, flip it carefully and cook for a further 10 minutes on the “thick” side. Take care when flipping to approach the fish from the side without the cocktail sticks and this will ensure that you have something good to present as well. I served mine with lettuce, fresh tomatoes, cucumber and anything left of the sun dried tomatoes. Lightly salted with a drizzle more of the leftover oil and there's you have the perfect healthy grilled trout recipe for a summers day.